Throughout 2019, Major League Baseball will honor the centennial of Jackie Robinson’s birth. Robinson made history in 1947 when he broke professional baseball’s color barrier by playing second base for the then-Brooklyn Dodgers. Robinson’s courageous actions spurred the racial integration of the sport, ending decades of segregated baseball. 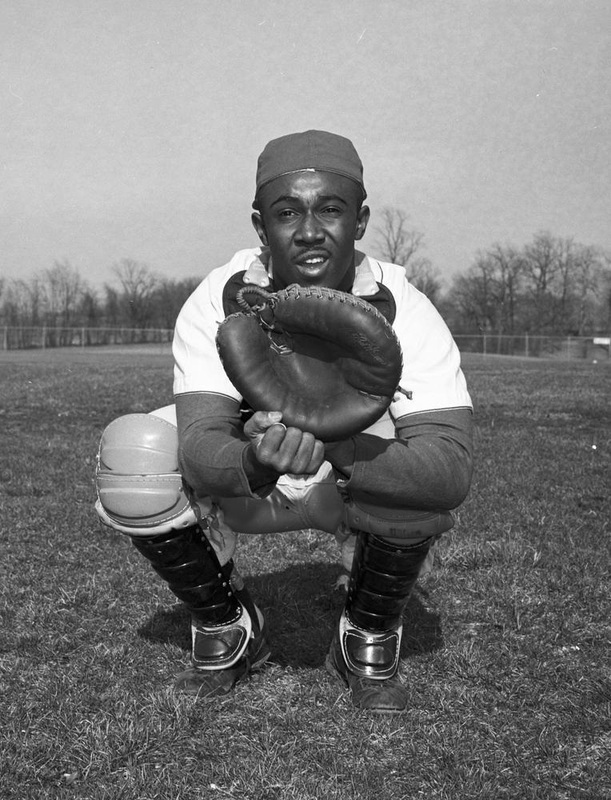 In 1956, Robinson’s last year in the majors, Indiana University’s baseball team welcomed its first African American player, catcher Eddie Whitehead. Whitehead, a native of Madison, Indiana, joined as a sophomore and was one of five catchers on the team that year. Though Whitehead made his debut nearly ten years after Robinson’s debut, a spring break trip through Florida and Georgia from March 26-31, 1956, illustrated the racial disharmony that was still prevalent throughout the country. 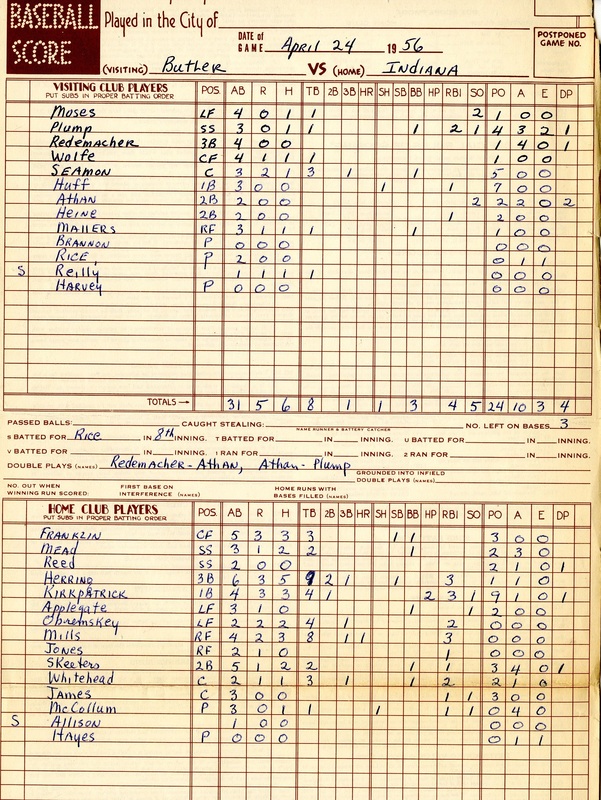 At the major league level, professional baseball would not be fully integrated until 1959, when the Boston Red Sox became the last team to welcome an African American player on its roster. At the collegiate level, a strict “gentleman’s agreement” prohibiting non-professional contests between African Americans and whites was in force in the South, meaning if Whitehead played, the other teams would not play I.U. According to a March 22, 1956 press release, I.U. entered into the six games without knowledge of this agreement, thereby hindering the team’s ability to pull out of the games. After speaking with I.U. President Herman B Wells, Whitehead decided he did not want to ruin the trip for his teammates by not going, so he decided to make the journey, though he did not play as per the agreement. In a 2017 Indiana University Bicentennial oral history interview, Whitehead’s daughter, Dr. Dawn Whitehead, recalled the stories her father told her about the trip. Traveling through the Jim Crow south was “a profound experience for him,” she said. “He often didn’t get to eat in restaurants with his teammates, and they would bring food out to the bus.” “He would also sometimes not be able to stay in the same hotels where his teammates stayed,” Whitehead recalled. Upon the team’s return to Bloomington, Wells expressed outrage at the treatment of Whitehead. “It’s outrageous the indignities now being suffered in the South by Eddie Whitehead,” Wells stated in a March 28, 1956, Louisville Times article. “This is very distasteful to me. I’m opposed to segregation in any form. Indiana is the leader in the nation against segregation in schools as well as in athletics.” Wells received numerous letters regarding the incident. Some came from supporters, while others came from those questioning his reasoning for allowing Whitehead to go when the team knew he wouldn’t be able to play. Whitehead played in 12 games during the 1956 campaign. His most notable game that year occurred on April 24 against Butler. He went 1 for 2, with a triple, one base-on-balls, and two RBIs. I.U. defeated the Bulldogs in an 18-5 thrashing. At the conclusion of the season, he was awarded a varsity letter. Whitehead graduated with a Bachelor’s of Science in 1958. He became a banker, a profession in which he remained for thirty years; he also worked on the statistics crews for the Indiana Pacers and the Indianapolis Colts. Whitehead passed away on September 10, 2014, at the age of 77.